Our second Poly-Snaps model is an Octahderon, with eight triangular faces. 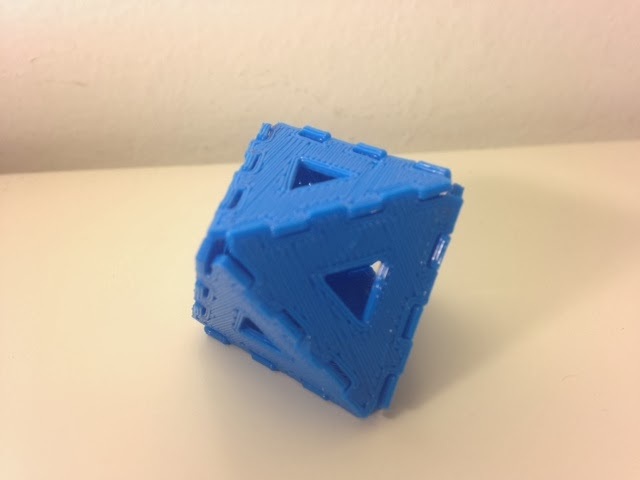 Compare with the Hinged Octahedron from Day 82, which is beautiful and prints in one piece, but has variable snap-numbers on its open edges and uses up a lot more material. Today's model makes use of the customizability of the Poly-Snaps, changing to very thin faces with large borders. Settings: MakerWare .3mm/low in almost no time at all.